WILLIAMS TRADITIONAL LINE #47015. 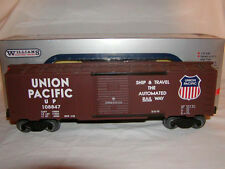 THIS FULLY ASSEMBLED "TRADITIONAL LINE" BOX CAR FEATURES DIE CAST TRUCKS. They must be authorized in advance. CAR LENGTH 10"---HEIGHT 3.5". Get images that. WILLIAMS TRADITIONAL LINE #47035. THIS FULLY ASSEMBLED "TRADITIONAL LINE" BOX CAR FEATURES DIE CAST TRUCKS. They must be authorized in advance. CAR LENGTH 10"---HEIGHT 3.5". Get images that. WILLIAMS TRADITIONAL LINE #47021. THIS FULLY ASSEMBLED "TRADITIONAL LINE" BOX CAR FEATURES DIE CAST TRUCKS. CAR LENGTH 10"---HEIGHT 3.5". WILLIAMS TRADITIONAL LINE #47020. THIS FULLY ASSEMBLED "TRADITIONAL LINE" BOX CAR FEATURES DIE CAST TRUCKS. They must be authorized in advance. CAR LENGTH 10"---HEIGHT 3.5". WILLIAMS TRADITIONAL LINE #47205. River-Gondola W/Barrels. THIS FULLY ASSEMBLED "TRADITIONAL LINE" GONDOLA CAR FEATURES INCLUDES 6 WOODEN BARRELS. They must be authorized in advance. CAR LENGTH 10"---HEIGHT 2". 1:48 scale, works equally well on "O 027 gauge". INCLUDED IN BOX IS THE WILLIAMS PAPERWORK. CLASSIC FREIGHT SERIES - THE CROWN EDITION LINE. NEEDLE POINT AXLES. COLOR OF BOX CAR IS BROWN AND WHITE WITH WHITE LETTERING. This car is a real beauty! More than one is available as this is written. Study the pictures, you be the judge. NO LOCAL PICK UP. No exceptions! There may be other fees required in your country to receive this item! Here is a Williams GMFRT-3 State of Maine Boxcar. Manufacturer: Williams. Operational Status: Not Applicable. This item has been graded per TCA standards C-10: Mint. Overall condition is Mint. Model Type: Freight Cars. Manufacturer: Williams. This item has been graded per TCA standards C-10: Mint. Overall condition is Mint. Original Box: Yes (P-10 ). Condition: Mint (C-10 ). Very Popular. Williams O Scale 47037 D&RGW 40' Box Car Free Shipping! Built date 3-55. Item # 47037.